किसी कमाल हायकू का सा असर है, केदारनाथ अग्रवाल की इस छोटी सी रचना में। पर यह हायकू नहीं है। शायद सरल साधारण मुक्त कविता है? अच्छा विधा की बात बाद में करेंगे, पहले रचना का रसास्वादन तो करें! 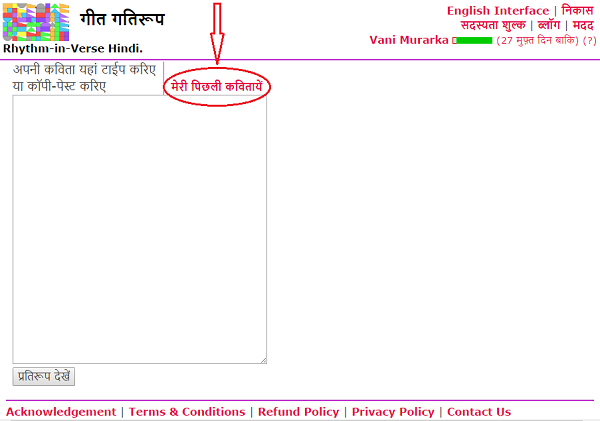 हुआ न असर? 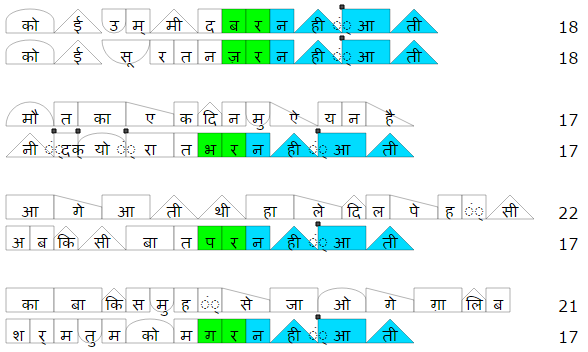 इतने से शब्द में एक स्पष्ट चित्र खिंच गया, और चित्र एक विस्तृत एहसास में बदल गया। एक पल, अनन्त की गहराई लिए ― ठीक वैसे जैसे एक माहिर कवि की हायकू अपनी डिबिया में छिपाए रखती है। पर यह हायकू नहीं है! ओह! 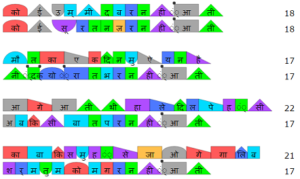 तो क्या यह बस एक मुक्त कविता है? 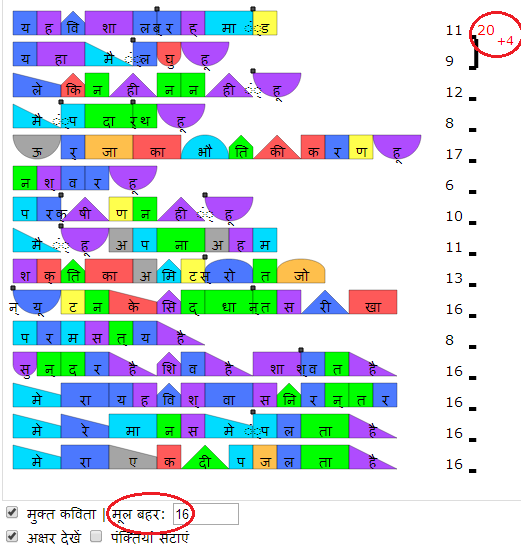 कवि ने अपनी बात कह दी और बस किसी चमत्कार से हम पर असर हो गया? शेर का संदेश तो मोहक है ही! अब गीत गतिरूप ग़ज़ल का रदीफ़ और काफ़िया का अनुमान कर बता सकता है| आप अगर ग़ज़ल विधा सीख रहे हैं या सिखा रहे हैं तो यह सुविधा आपके ख़ास काम आ सकती है| ग़ज़ल के शिल्प के विषय में आप यहाँ पढ़ सकते हैं – Basic Structure of Hindi Poetry Part 4: Correspondence with Urdu Poetry. 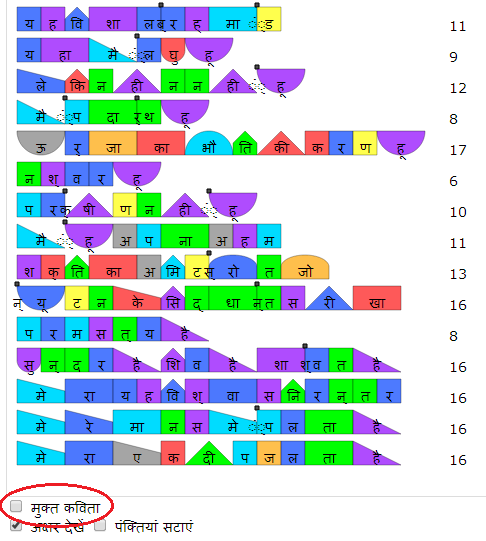 अभी भी काफी असमानता है – 65, 56, 64, 76 | फिर भी 56, 64 में यह समानता है कि वह दोनों 8 के गुणज हैं (multiples of 8)| तो क्या रचना का मूल बहर 8 है? 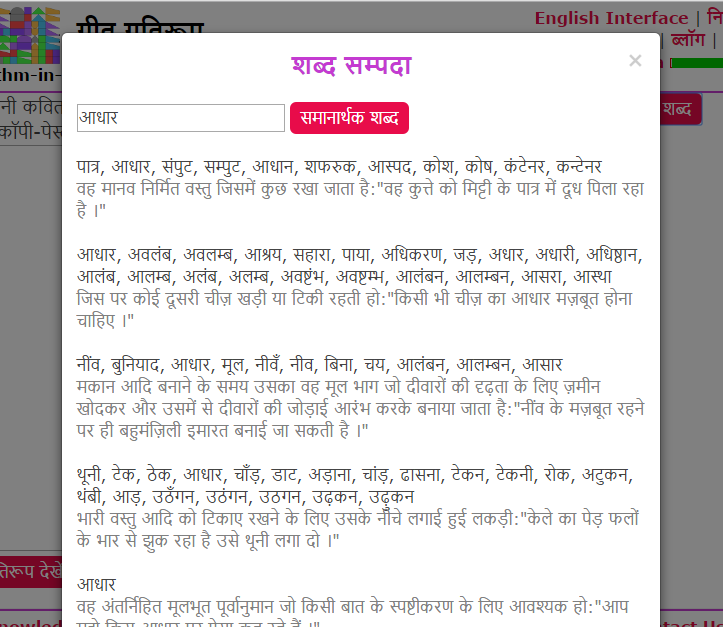 गीत गाता चल ओ साथी, गुनगुनाता चल! 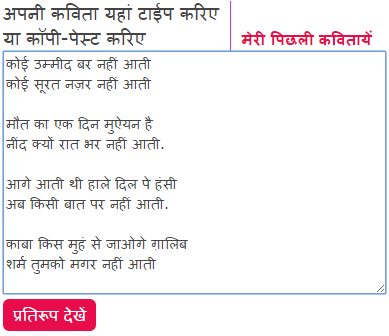 A portion of the poem “Jeevan Deep” by Vinod Tewary, has been used here for the examples. 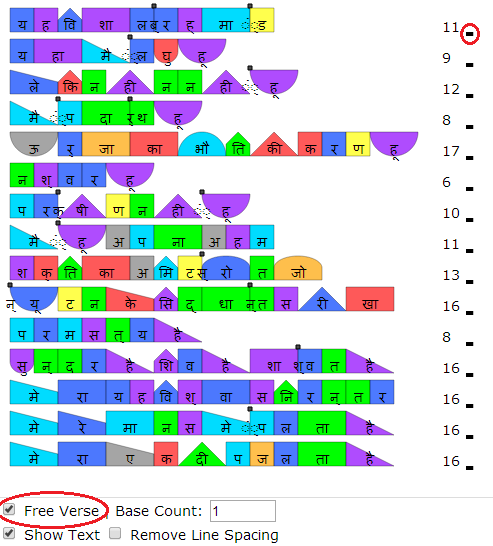 To use the Free Verse feature, click the “Free Verse” checkbox below the generated visualization. 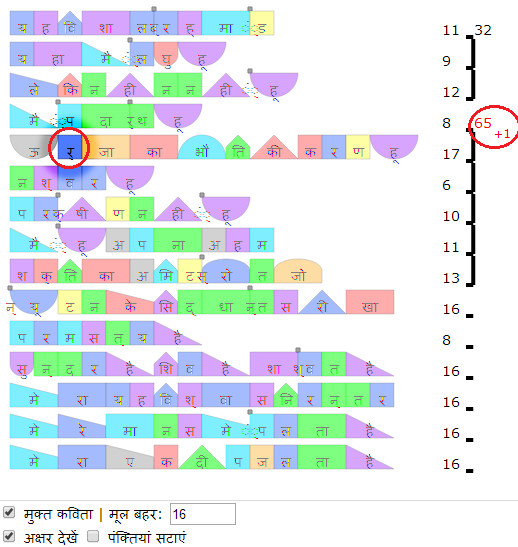 Short black lines will show up beside the maatraa count of every line. To combine lines which go together as per meter, click the short black dash. 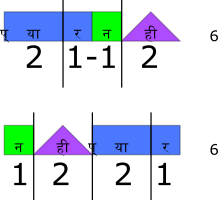 The line will be combined with the line below. 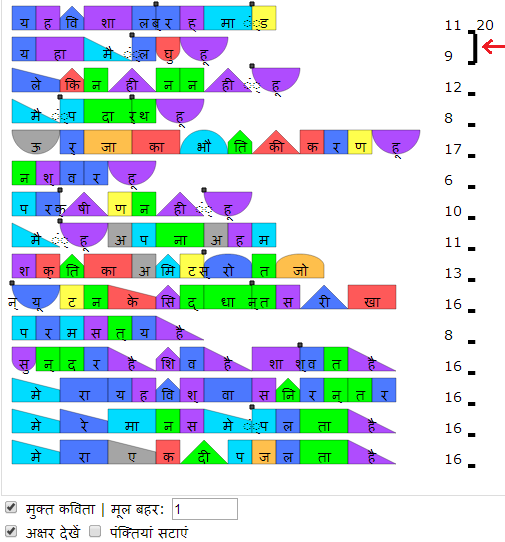 The total maatraa count of the combined lines will be displayed. 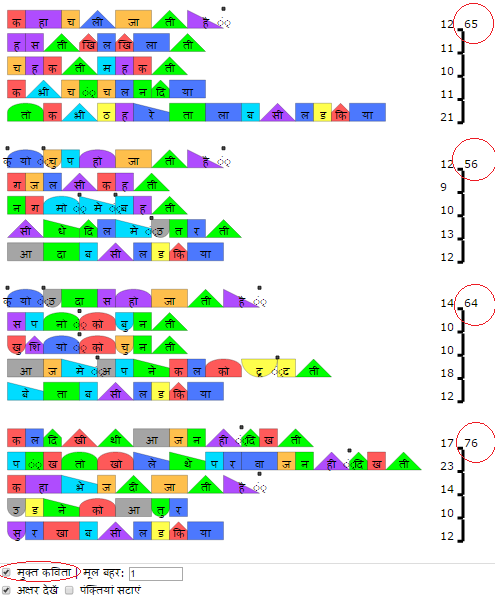 To disconnect lines, click on the vertical combining line. 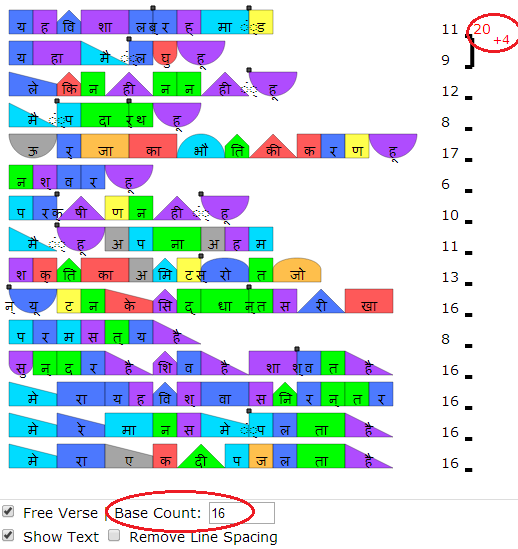 You can specify the basic periodicity of your poem in the “Base Count” box below the visualization. 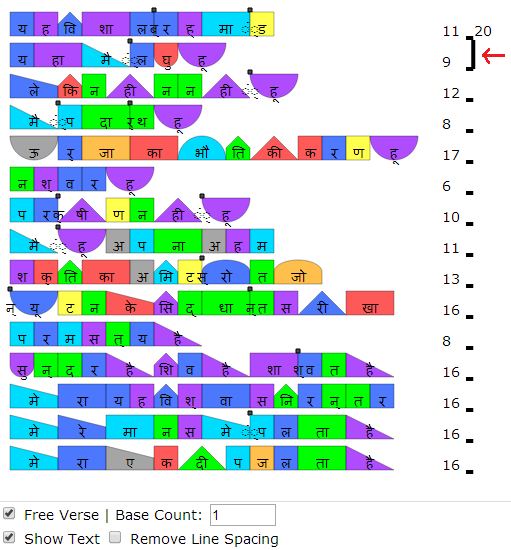 For example, for this poem “Jeevan Deep” the periodicity is of 16 maatraas. 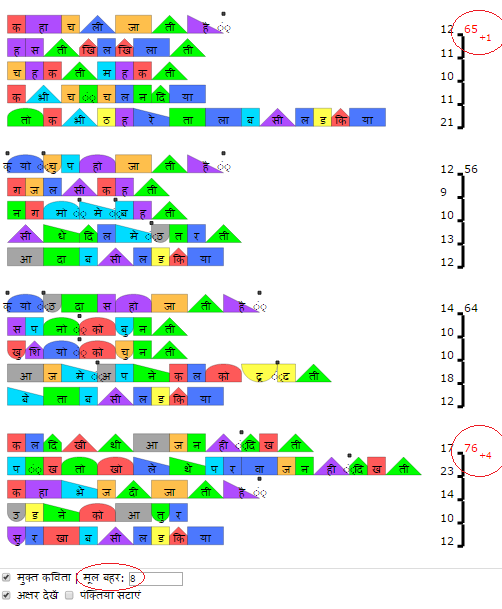 By giving the Base Count, you can see how off or within the periodicity is the total maatraa of the combined lines. 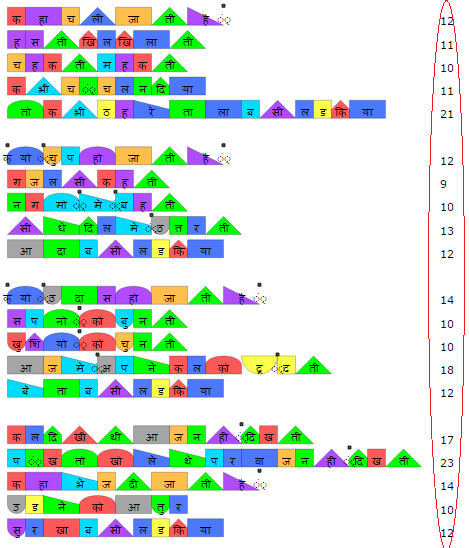 If the total maatraa count is off the basic periodicity, it will be displayed in red, along with an indication of how many maatraas are missing or are extra. 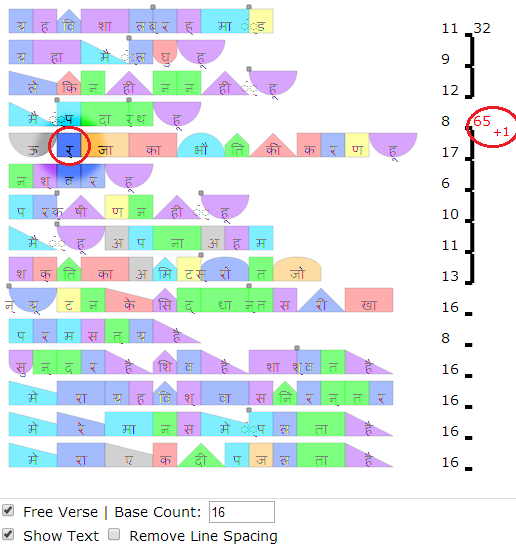 Accordingly, you can edit the lines of your poem as you find appropriate. 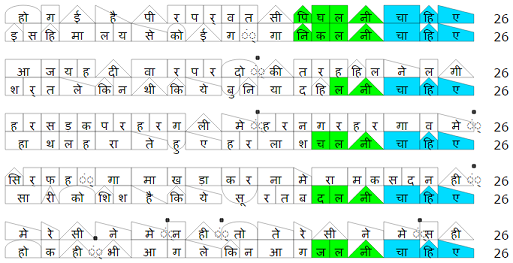 The earlier features of adjusting the maatraa allocation for deergh swar and half letters can also be used for your free verse. 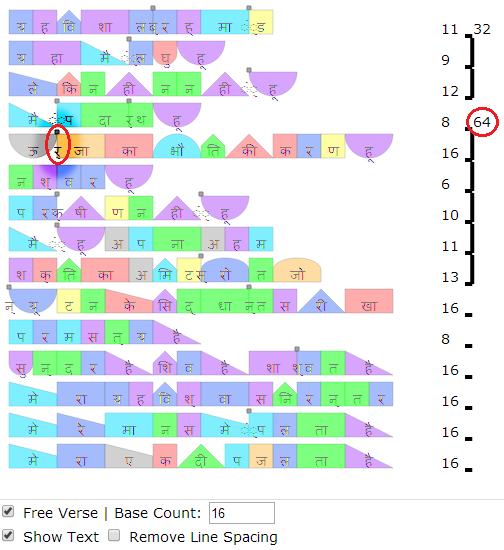 For example, in this poem excerpt, the second set of combined lines is coming to 65 maatraas. 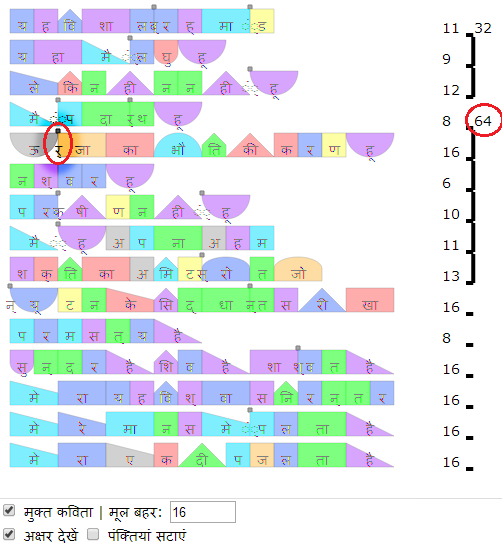 This is 1 maatraa more than 64, which is a multiple of 16. 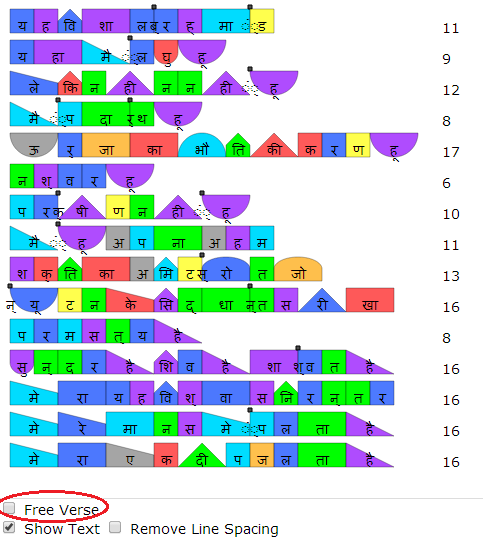 To know about the role of rhythm in free verse in greater detail, please read this article. 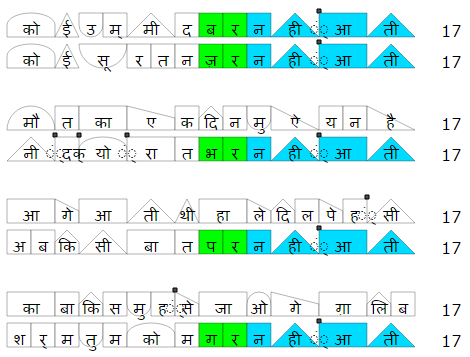 Some of you have asked for an offline version of Geet Gatiroop that you can download and use on your computer without the internet. 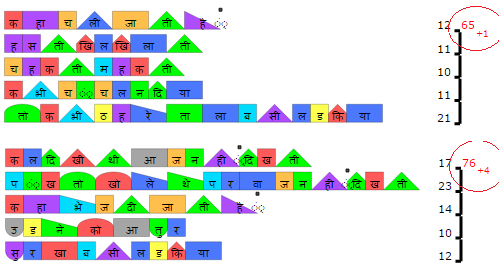 We are working on this and as soon as it is ready, there will be a post here on this blog, and you will receive an email if you have subscribed for Geet Gatiroop updates.